Seeing in the first chimes of 2018 were partygoers from Down Under who were joined by a reported 80 nationalities in Scotland’s capital on Sunday evening into Monday morning. 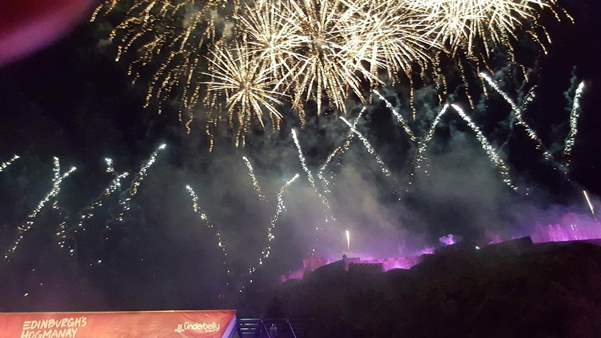 The annual high energy celebrations were marked this year by an expanded fireworks display high above Edinburgh Castle, now lasting a record non-stopping nine minutes. And all against the picture-postcard backdrop of Princes Street’s Christmas Markets and its towering Ferris Wheel. As crowds thronged the surrounding gardens and streets, closely guarded by a tight police perimeter, the tens of thousands gathered within were treated to iconic 1980s rockers The Human League and contemporary singer-songwriter Rag ‘n’ Bone Man, who each took up stages within the city centre’s greens and bridges. Forever competitive, Edinburgh’s claim to be “the only place for New Year’s” was backed by cutting edge event design, led by Head of Ceremonies for London’s 2012 Olympics. The extended fireworks display was serenaded with a dramatically bellowing soundscape extravaganza, heard city wide. Equally deafening yet impressive were enthusiastic screams coming from Loony Dook swimmers who plunged heartily into icy cold waters hours later at nearby South Queensferry. Now a twin tradition with the iconic Street Party, among the 1,100 ‘dookers’ from 21 countries were Sydney-siders Amy Hathaway and Simon McAuliffe (pictured, top). 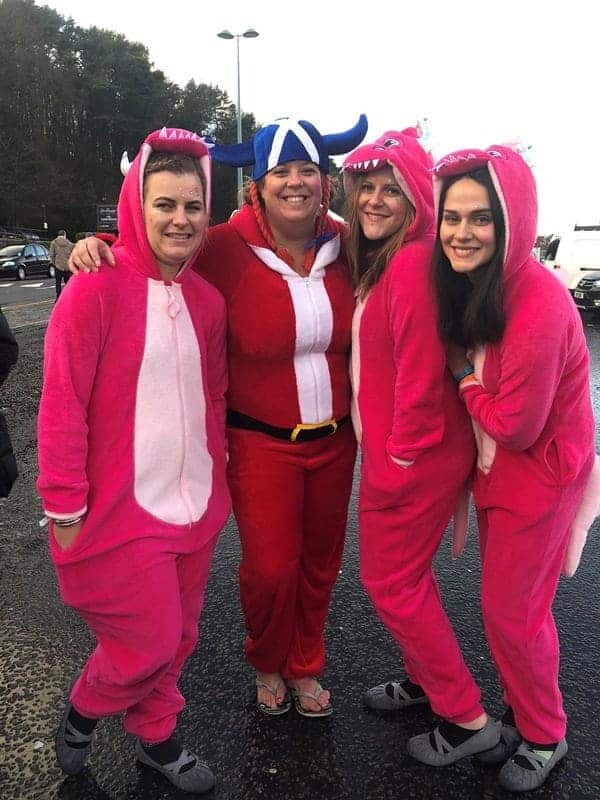 In imaginatively chosen gear and costume, Aussie and Kiwi fellow tour bus partygoers donned pink Loch Ness monster attire and plunged happily into bone chilling waters beneath the iconic Forth Road Bridge. London-based teacher Rebecca Keen, from Castle Hill, NSW led other antipodeans into the freezing depths, resolute that “even though Sydney has incredible fireworks, the party here in Edinburgh is unparalleled”. Yet despite competing New Year’s events in London, Manchester, and across the UK – not to mention other European capitals – and back home in the southern hemisphere, Scotland’s draw remains. “I’ve done New Years celebrations in a lot of places but this was the best New Year’s Eve I’ve ever had” added the appropriately eager, Bec Keen. “Edinburgh’s vibe around the city is electric. I’ve never experienced anything like it”. Traditional among the Scottish-based festivities now includes the required marking of 2018’s chimes throughout Australia and New Zealand. Co-celebrations were led by Edinburgh’s antipodean bars beginning at 11am (for Auckland) and 1pm (for Sydney/Melbourne) and others onwards.